Big 10 1/2" stainless steel blade. 15 1/2" overall. Full brass tanguard and brass rivets. Stitched and braided leather sheath. Brass plate on handle for name inscription. Knife is thick & heavy which a bowie should be but the sheath which is advertised as "genuine leather" is hardly that not even in your dreams & it quite cheesy at best so I gave the whole package 3 stars for that reason. I would gladly have paid a few extra $ for one of much better quality. I'm looking for someone to make a Real Leather sheath for it. All in all I would recommend it to anyone who wants a sturdy knife at a very good price. But do yourself a favor & find someone who works with & makes leather goods & have them make a good sheath for it. Piece of Pakistani made crap! Ordered two on basis of the catalog description. When they arrived, one had a loose brass rivet in the handle and BOTH leather sheaths had problems. The snap clasp for the handle was too short on one and the snap was entirely missing on the other. No one even bothered to inspect this merchandise before it shipped. I expect more from BudK. I can say this is a nice bowie. I don't really like the leather sheath it comes with. But that is something I can change. And another thing I don't like is the wooden part of the handle . The edges are a little to sharp for my liking but I do wood working and it's nothing some sandpaper can't handle. But all in all it's a great knife. I think everyone should own one. 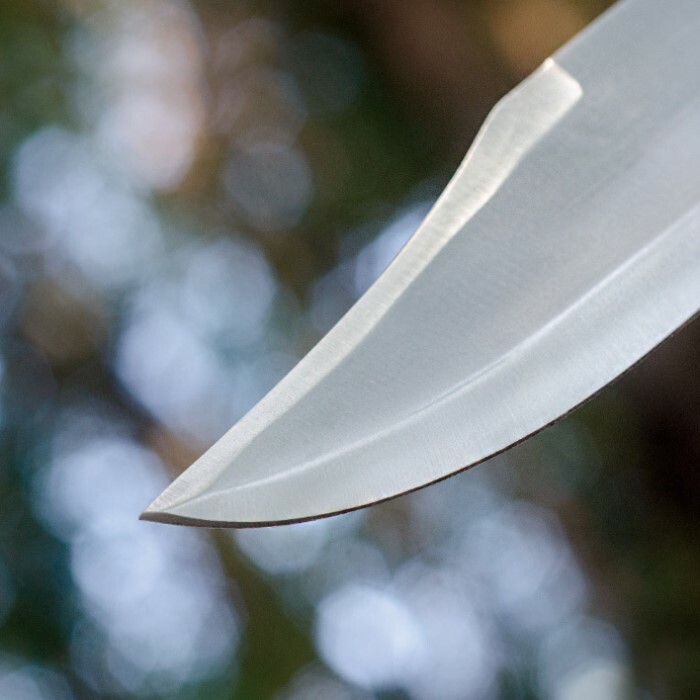 The knife is hefty and well made except for the handle, it should be rounded to make it comfortable. The sheath is useless. Over all a good knife to beat around, impressively big. This is absolutely my favorite knife in my 20+ bowie collection. It is very well made and totally traditional in design. 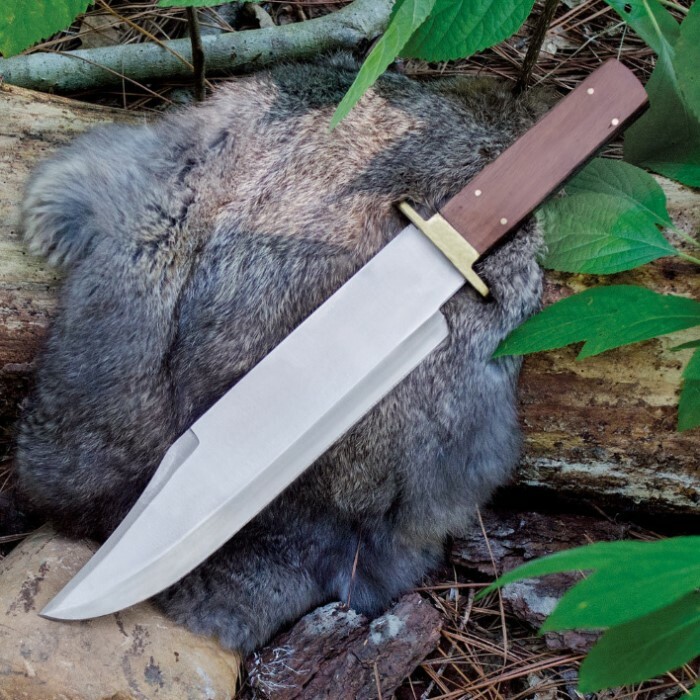 I have ordered several of these because I have a friend making custom sheaths for them. The sheath the knife comes with is below my standard but the knife itself more than makes up for it. I purchased this knife as a gift for my uncle. He rides motorcycle and horses. a great knife that can be worn on the leg or saddle i thought. The brass insert is on only one side of the handle, the back side, so it cannot be seen when sheathed. i ordered with engraving. Even after calling to verify and seeing pics on here of the brass insert as being where engraving would be, the blade was engraved. the sheath is covered in an off white powder and grease (lithium?). the sheath is weak and very thin sewn together with thick plastic cord. the brass has rust spots (i didnt know brass rusted?!) the wood for the handle is in very poor shape (dry and splitting), and the brass insert is crooked and has glue overlapping all around it. the blade had burn marks (from the grinder) here and there. 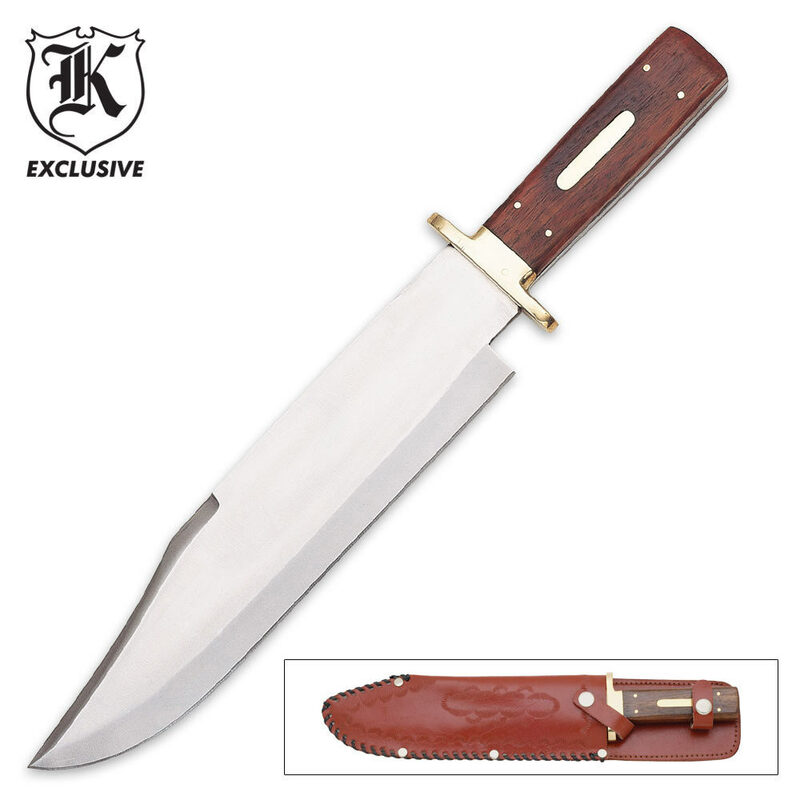 this knife should be priced at 8 dollars at most. since it is a gift i will be spending 22.95 getting the brass insert engraved and a new sheath made so the insert is visible. that will be 77 dollars. I got this one to see if it would be a nice gift. With some polishing it will, but it was a little below the fit and finish of the other bowies i bought. Nothing a little work won't fix. for the money, this is also great value. I could just use it as a thrower as is, or sharpen it and use it as a camp knife, althouth it may be plenty sharp for most camp duties already..this one wasn't quite as sharp as the others either, but i am still pleased with it. The sheath won't buckle over the handle, though and that is why the 4 stars...i swapped sheathes with the bone handle bowie i also bought...problem solved. I bought the Antique Bowie as a gift for my 11 yr old grandson. The knife was well made and a great value. I also gave him a book about the life Jim Bowie. He loved both, and now after watching the movie "The Alamo" with Billy Bob Thornton, he is hooked on American history and knife collecting. He is currently reading a book about Sam Houston and David Crockett. He has also started shooting a 50 cal black powder rifle, getting ready for the Youth Deer season in MO. he's looking forward for another BUD-K knife at Christmas!